In a press release Q&A issued by Konami today, Metal Gear creator Hideo Kojima stresses the importance of the PSP installment of the Metal Gear Solid series, calling it, "a MGS5-class game." While the PlayStation Portable is no stranger to side stories and throwaway tie-ins to otherwise major game franchises, that simply isn't the case with Metal Gear Solid: Peacewalker. Kojima is up to his arms in the title, assuring fans that Peace Walker is an important part of the MGS series. In fact, Peace Walker is so important that Kojima changed his mind about simply handing the property over to a new group of creators. As for the actual game mechanics, Kojima couldn't give away much. 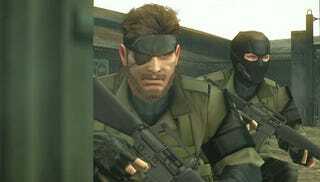 He explains that the player will be able to customize their Snake before going on a mission, outfitting him with the equipment that best suits their play style. Charge in with guns blazing, or opt for a more stealthy approach, slimming down your arsenal in favor of quieter movement. Peace Walker will also include a "growth feature" that allows your character to evolve, a simliar mechanic to that seen in roleplaying games and recent first-person shooters. And yes, there will be multiple types of cardboard boxes, complimenting the two-man version we witnessed in the E3 trailer. Finally, Kojima gave us a little insight into the strange code that appeared on the teaser website that kept us so occupied leading up to E3 2009. This gets a little complicated, so I've gone ahead and included his full description. Kojima Productions Countdowns To... E3 Website. The first symbols that appeared were the number "5" and the letter "S" for Snake that represented PW which, to me, is a "5" class title. "巳" not only hints at the lowercase lettering of "E" for E3, but it is the kanji for the word "snake." Also, the symbol that appeared at the very end is the kanji "日" and represents a sunny background and the sunrise that links to RISING. I'd predicted all of those symbols would eventually lead me to an aneurysm.